The BEST Chicken Parmesan. A quick and easy 30 minute weeknight meal everyone will love! Now I know that’s saying a lot but this Chicken Parmesan is pretty darn amazing. 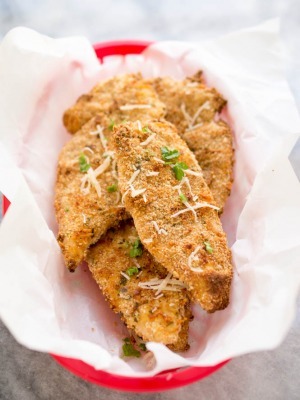 Juicy, tender chicken breaded in a mixture of parmesan cheese and panko breadcrumbs. 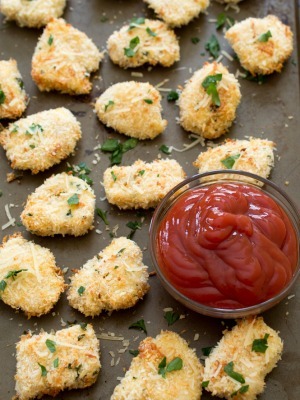 Pan fried until golden brown and topped with melted mozzarella cheese and marinara. This Chicken Parmesan is one of my all time favorite meals. 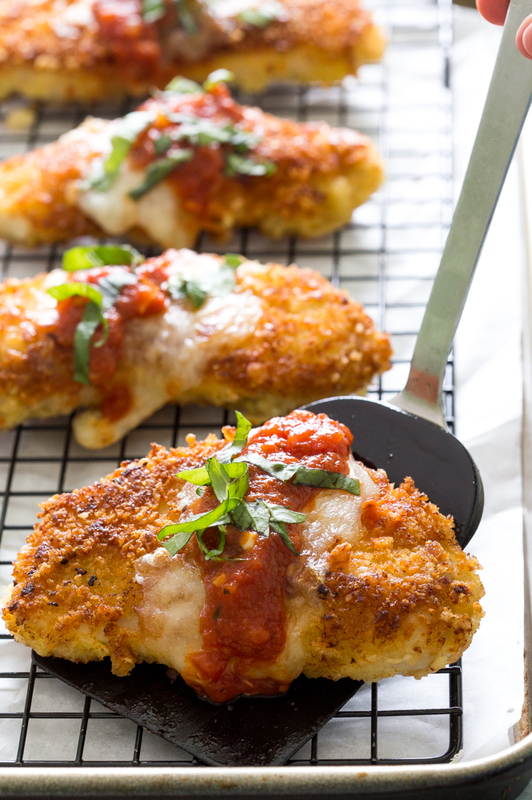 This Chicken Parmesan is super easy to make. It takes less than 30 minutes to make start to finish. This recipe starts with a 3 step breading process. Flour, egg and parmesan breadcrumbs. I use skinless boneless chicken breast and cut them in half. I pound them out to a 1/2 inch thickness. This keeps the chicken juicy and tender. The best way to bread the chicken is to keep one hand for wet ingredients and one hand for dry. This helps from getting the dreaded breading hands. Replacing some of the breadcrumb with parmesan cheese helps to keep the breading crispy on the outside. Pounding the chicken to a 1/2 inch thick keeps the cooking time down and the chicken juicy and moist. Serve with a big plate of pasta and extra tomato sauce on the side. Enjoy! Cut chicken in half horizontally. Pound each piece until 1/2 inch thick. Sprinkle with salt and pepper. Add chicken two at a time to the skillet. Cook 2-3 minutes on each side or until golden grown and cooked all the way through. Place chicken in a pan or sheet tray and top with mozzarella cheese. Broil on high until melted and bubbly. Top with tomato sauce and a sprinkle of basil for serving, if desired. Serve immediately. Officially adding this to our menu this week! It looks so amazing. 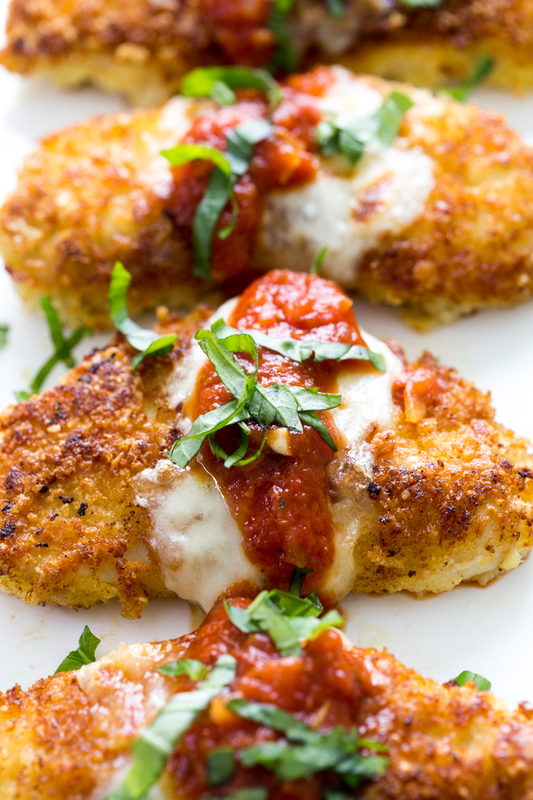 Kelly, the photos make the chicken parmesan look so bite size, but really, I am thinking that this is one amazing looking bite size recipe 🙂 I think I am going to make them right now! I just tried this recipe tonight and it was delicious!! It gets so beautifully golden brown and crispy with the panko and Parmesan cheese, and it’s just as quick and easy as you said! Thanks very much for a great recipe! I made this chicken for dinner and it was gone in a second!!! 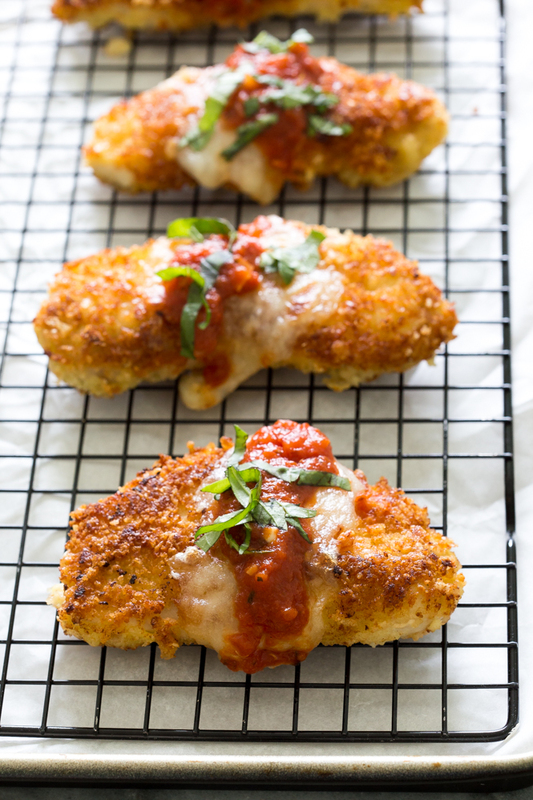 This truly is the BEST chicken parmesan recipe. I used thin cut chicken breasts, pound them out on both sides with a tenderizing hammer, place in a gallon ziplock bag then pour buttermilk into the bag of chicken, covering the chicken. Zip the bag securely removing as much air as possible then marinade the chicken in the buttermilk overnight if possible. After that I followed the recipe exactly except instead of tomato sauce. In a sauce pan added 1 can of italian recipe tomato paste cooked with 1 can of italian recipe diced tomatos. Added some fresh basil and a shallot I had chopped up and sautéed in butter for the sauce. I melted shredded mozzarella like the recipe called for but had some fresh mozzarella in the fridge so I melted slices of that on top as well, then topped with fresh basil once the chicken was finished cooking and ready to serve. 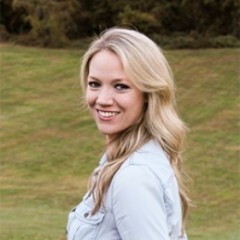 Thank you so much Jennifer!!! I am so glad you liked it! How many degrees is your last instruction bullet point — “broil on high”? My oven just has numbers. Thanks. I would do 500 degrees fahrenheit and keep and eye on the chicken as you would when broiling. I want to cook this ahead of time for a group. Can I bake it in oven instead of pan by dipping in butter? Yes you can bake it in the oven. I personally have not tried baking this but I would try doing 400 degrees in a lightly oiled baking sheet or dish until the chicken is done (about 20 minutes). It was a let down, but I will know better next time. Yes, I will be making this again. I can only imagine how much better it would have been if I had used actual Marinara sauce. Well why didn’t you use marinara then…? That’s obviously what the blogger meant. This looks wonderful! Do you think I can make the chicken up and freeze them? Would you freeze them uncooked? You can do either option but I personally prefer to cook them first and then freeze them. I’ve tried a few of your recipes and all of them were a hit with my family! This looks amazing! I will definitely give this try! Thanks for all the wonderful recipes. Makes my life a little easier! Thank you so much Czarina!! I really appreciate it! Wow this looks great. I love Chicken Parmesan. We cook so much chicken in this house that this would be a great way to change it up. Will be trying this one very soon. Thanks! Why, oh why, oh why, do you leave comments before even making the recipe??????? what kind of marinara sauce would you use? I typically make my own so I don’t have a go to marinara sauce to recommend. Sorry about that. I have not tried baking these yet. I think at a higher temperature these should get nice and crispy in the oven. Delicious!! Love how crispy they are. This look so gooooooooood. I will prepare this chicken tomorrow, thank you fir the recipe!!! I just made this tonight. My daughter and her friend said dinner was bangin’ so it’s a keeper. The chicken was so moist and tender. Thanks for the recipe. Delicious – moist and crispy, it goes in my favorite meal rotation. I sliced the chicken thinner (rather than pound it, because of the noise factor), let the mozzerella melt in the pan with lid on and topped with lite marinara sauce. I used a zip lock to bread the chicken, one side for wet and one side for dry. I can hardly believe that I made something so awesome, it is nice to have a quick 5 star recipe, I almost always have the ingredients. I made this tonight and it was both simple and delicious. The chicken was cooked perfectly. I did use chicken tenders instead and was able to skip the slicing and pounding the meat. Thanks for sharing. Your photos are awesome and make me want to make this right away! So simple and delicious, I am looking forward to trying your recipe. 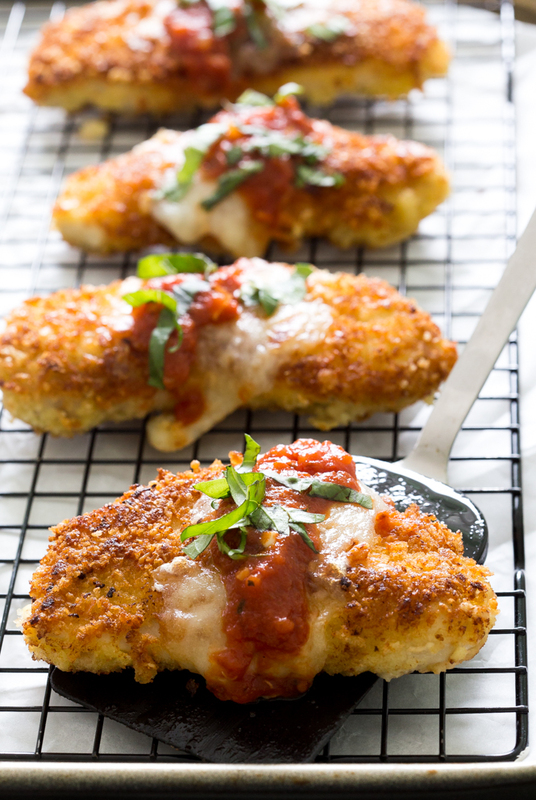 I love chicken parmesan and I know my kids will too. Thank you!